For those frugal travelers coming into NYC for some deals on Black Friday there is some hope of having a good time even after the wallet is empty. NYC is, like many other cities is much more fun without a budget but there’s still so much to do. It just requires a little more thinking, planning and possible a little more walking or time on the subway. One of the best ways to spend an afternoon after exercising the wallet here in NYC is spending some time at a local ice rink. It doesn’t have to be crazy over the top expensive. Here are some choices which can keep the budget in check while visiting NYC this weekend. There a number of places around Manhattan to skate. If you can bring your own skates it’s less expensive and even free in some locations. The first one that comes to mind to most is Rockefeller Center. Some people just dream about coming here to skate and there’s nothing wrong with making a dream come true. It’s good to know what you are getting into beforehand. Well…it maybe an icon but it’s small (the Ice Rink website even says no more than 150 skaters at a time), usually packed (line at peak times is 1-2 hours long), and expensive (you can skate as long as you want but it’s $10-14 for admission and $8 for the rental if they have your size). If you have to go it’s a good idea to go first thing, during the week and way before the holiday season. This year that means in the next couple days. If you really want to skate but $18-22 per person exceeds the budget I suggest a couple of very nice, larger and more affordable places. The first one that comes to mind is the Ice Rink that is just a few blocks away from the Rock and it’s located inside of the historic Bryant Park. There is 17,000 square feet of open ice for skaters to twirl around in. They do not charge admission so if you bring your own skates it’s FREE, but the skate rental is $13 (rumor has it is that they are clean and comfortable if that makes you feel better). Bring your own lock and your shoes can be safely stashed away for free. (the Rock’s lockers are for members only…sorry) Just keep any bags and larger items back at the room because they charge $7-10 for bag check at Bryant Park. I didn’t say it was all free. It just can be if you are frugal and think ahead. On the northern end of Central Park sites the Lasker Rink and Pool that was built in the 1960’s. The park as two rinks. One for the hip checking high school hockey players and another for all ages. The park charges $6.50 for adults, $3.50 for youths, and $2.25 for seniors. The skate rentals for all are $5.50 for all and a lock costs $7.50 but you get back $4 of it when the lock is returned. That’s fair. If you have your own skates then it’s a bargain at $2.50-6.50 per person. There are some unfortunate rinks that didn’t make it out this season. 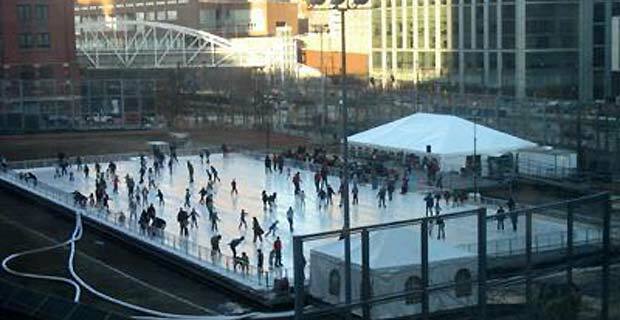 One of the tops on my list in the rink located in Battery Park downtown. They didn’t seem to find the right contractor to take over the job. The site also had some problems due to extremely cold temperatures, larger amounts of snow fall and incidence of fallen debris from nearby construction sites. Skating is not fun when windows and plywood are in the way. The skating was $10 with or without rentals which was the best deal around. I can only hope it maybe makes a late season debut or comes back next year. I have a feeling the price may go up as it usually does in NYC. For more info on other area rinks check out the New York Led﻿ which has put together a great guide to these and other NYC metro area rinks. Get out and enjoy the kind weather we have been enjoying this mild fall here in NYC. Black Friday can be a fun day if you include some outdoor activities like skating. Happy Skating..and shopping as well!! Next PostNext Time to trim the tree…let the Holiday Season Games begin!